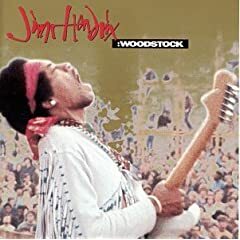 While I have seen the film "Woodstock" and many other Hendrix performance films, I've never sat down and listened to a live performance. I know everyone knows Hendrix is a guitar legend, but listening to a real-time performance highlights just how far ahead of his time Hendrix was. (Jimi has such incredible stage presence, you end up paying so much attention to the images rather than the sounds.) It's amazing that this man did so much with the art of guitar playing in his 27 years. Here in Seattle we have Paul Allen's Experience Music Project museum. I've been there quite a few times, and they have some amazing Jimi Hendrix exhibits. They have Jimi's childhood record player, many handwritten lyrics sheets, and the actual guitar he used at "Woodstock." If you're ever in Seattle and want to see an amazing piece of music history, check it out.